Picking up and moving to a new home is tough, no matter if the move is right down the road or across thousands of miles. 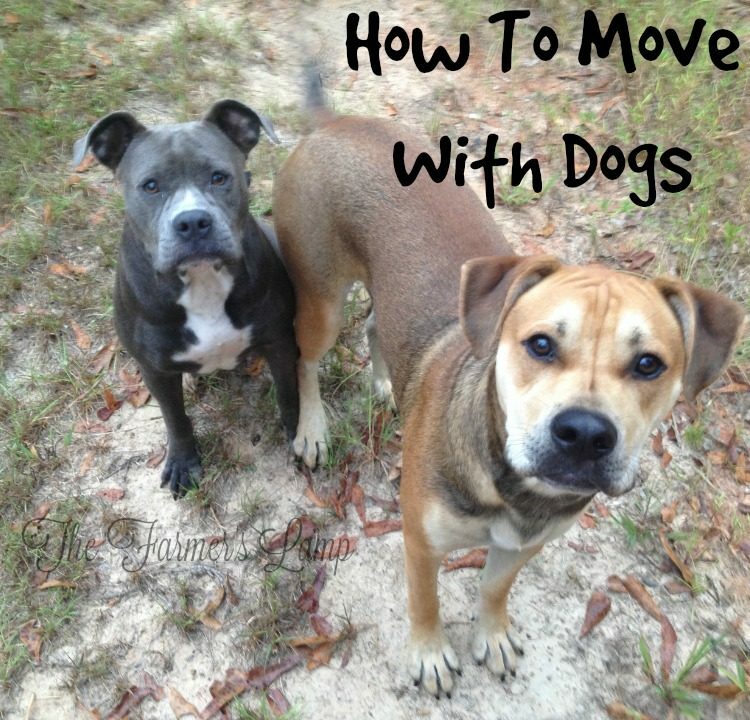 Knowing how to move with dogs is essential to a smooth transition for them. It will make your move experience as pleasant as it can be under the strain. When moving, everything has to be packed away, hard decisions have to be made on what needs to go and what needs to be let go of. Some of the farm animals may not be young and healthy enough to survive the stress of the trip. We weren’t able to bring any of our livestock. They were all sold to good homes, but The Pack is never an option for me to leave behind. My dogs are everything from protectors to lap dogs. When nothing else is going right or I have aches and pains in my body, one of the best ways I manage stress is to take time to pet and love on my dogs. Yep, The Pack is one of my top priorities when planning to move to a new location. We recently made a move from the farm in Louisiana to northern Idaho. Our Pack came with us. They are Roxie and Bowser. She’s a three year old blue pit bull and he is her brindle pup. We took some special steps to minimize the stress of 2,500 mile 4 day trip. I was glad I had learned how to move with dogs from past experience. First, we try and feed our dogs Non-GMO food or at least a grain free food. A healthy dog can take more of the stress of moving better than a dog who already has digestive or other general health problems. We also make sure they have plenty of water from a pure source like a deep well or a clean mountain stream. Water purity is becoming a big issue these days with all the fracking, chemical, and pesticide use plaguing our environment. On the subject of water, stagnation is something to watch. Stagnate water can cause deer to get what some call blue tongue and die. It’s also a health risk for your dogs. If you run your dog’s water through an alkalizer this will turn slightly stale water into living, wetter water your pet will love. Have you ever noticed how tap water will be sitting in your dog’s bowl and they’ll walk right past it to go outside and drink rain water from a puddle? Dogs know the difference between stagnate water and living water. We bought a pitcher alkalizer for under $60. So now that we have the healthiest dogs possible, how do we minimize the stress they experience during our move? Just like water is a mimicker of the energy surrounding it, your pack reacts to your energy. Your pack looks up to you and feeds on your energy. One of the best ways to minimize their stress level is to minimize your own. If you are stressed, so are they. When preparing to move with dogs, it’s important to pay attention to your energy and take time for yourself. As you are packing, make sure to keep up your daily routines. If you take your pack for a walk around 8 a.m. everyday, then make time to continue this needed exercise. Is 6 p.m. your snuggle and lap time? You got it, try and keep these routines in place. 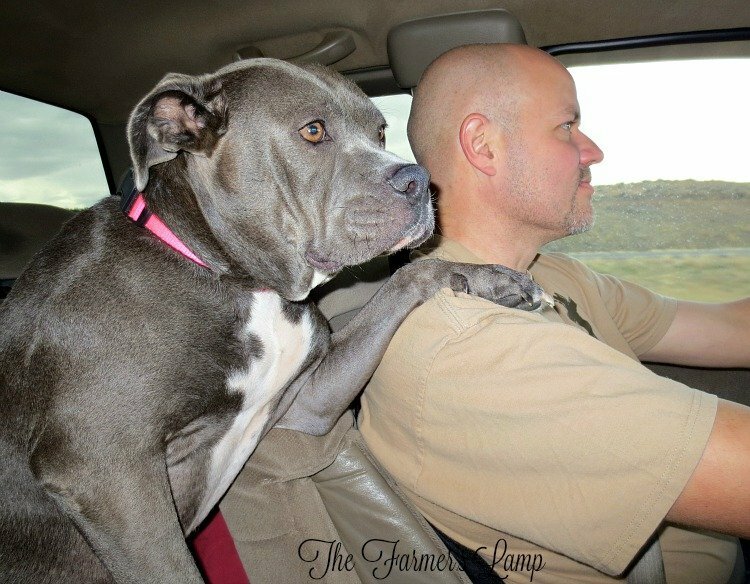 When it comes time to move, it helps if your dogs are in the habit of going for rides in the vehicle they will be traveling in. I’ve found it good to give your dogs a treat to test their ability to keep food down while traveling. This also lets them know it’s OK to eat on the road. If you have a dog who gets car sick, make sure you feed them 4-6 hours before they ride. This will allow them time to digest and minimize the possibility of motion sickness. Bowser has trouble with car sickness so we fed him when we stopped for the night. Your dogs will eat and drink less when traveling since they aren’t expending as much energy. While loading your Pack, it always helps to place their bed and a couple of their toys in the spot they will be riding in. These have their scent and will help them to feel secure and calm on the trip. I use lavender essential oil on their beds and allow it to permeate the vehicle as it has the ability to calm both humans and animals. While traveling, our Pack doesn’t have to stop for a restroom break as often as I do. However, it’s good to let them stretch their legs every 2-3 hours if possible. Interstates have rest areas with a place to walk leashed dogs. Some states even have a good sized fenced area to let your dog run free. The Farmer’s Lamp Pack used this as a time to try to get the scent of every dog who had been there before them. Remember to keep the normal pack discipline. If it’s not allowed at home, it’s not allowed on the road. This keeps their world consistent which is important in the animal kingdom. Just a side tip here. There are many pet friendly hotels. Some have fees and some don’t. Some have weight limits and a limit to how many dogs per room. We used the BringFido app to help us locate hotels along our route. Moving with your dogs can be a time of growth for them as they’ll experience new sites, sounds, smells, and people. It’s up to us to do all we can to help make the transition as easy on them as possible. If you’re like me, it’s important to make sure they’re happy and healthy. Do you have tips for traveling with dogs? Please share them with us. Moved with your Pack before? Share your experience. Thank you Janet for taking the time to comment. Roxie was very skiddish at the new “night” sounds. We moved their bed from the truck to the floor beside me. I was able to correct her pretty quickly. My pits aren’t very vocal so barking wasn’t the issue as much as the deep protective growling. I would suggest that she keep him well exercised before bed and put some lavender oil on his bed. I dilute it in a spray bottle of water and witch hazel and mist their bed. They aren’t crazy about the smell, but will lay down anyway. Keeping them close, even on the bed with you will work too 😉 The most important thing for them is for their human to be calm and as unstressed as possible. I hope this helps and good luck to her.